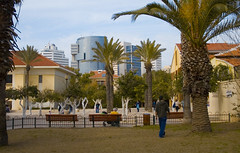 Neve Tzedek was established in 1887, over 20 years before the City of Tel Aviv was created. Similarly, though, it was created by a group of families seeking a peaceful life outside of overcrowded Jaffa. Desiring a more simple life, the new residents constructed colorful, low buildings along narrow streets with then-modern luxuries such as private bathrooms and toilets. By the start of the 1900’s Neve Tzedek, had become an oasis for many artists and writers including future Nobel prize laureate Shmuel Yosef Agnon, and famous Hebrew artist Nahum Gutman. As time went on, though, and the City of Tel Aviv developed, Neve Tzedek fell into decay. The North of the city, developed by the wealthier Ashkenazi (European Jews) attracted many of the richer residents of the south, and as they left, buildings began to fall into neglect. So much so, that by the 1960s, city officials deemed Neve Tzedek, which was now part of the city of Tel Aviv, a rundown slum-like area, incompatible with the bustling North. 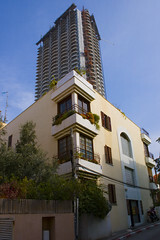 They planned to demolish the neighborhood and construct high-rise apartment blocks. Thankfully, however, these plans never came to fruition, and as many buildings were placed on preservation lists, a new breath of life was breathed into Neve Tzedek as restoration works began in the 1980’s. The result has been that Neve Tzedek has grown into an oasis of tranquility in the bustling city, a real estate and cultural hotspot. Neve Tzedek is today a real oasis in the bustling city of Tel Aviv. The magnificent buildings are all individual, and a relaxing stroll through the neighborhood is a great way to spend some time. Shabazi Street is the main street through Neve Tzedek and, like many of the smaller side passages is lined with boutiques, galleries, and craft shops. The Suzanne Dellal Center is Tel Aviv’s dance center with a superb piazza and interesting gardens, whilst popular cafe Suzanna shouldn’t be missed. The neighborhood of Florentin offers one the chance to see a less regenerated version of Neve Tzedek which is now the hottest Tel Aviv nightlife area.